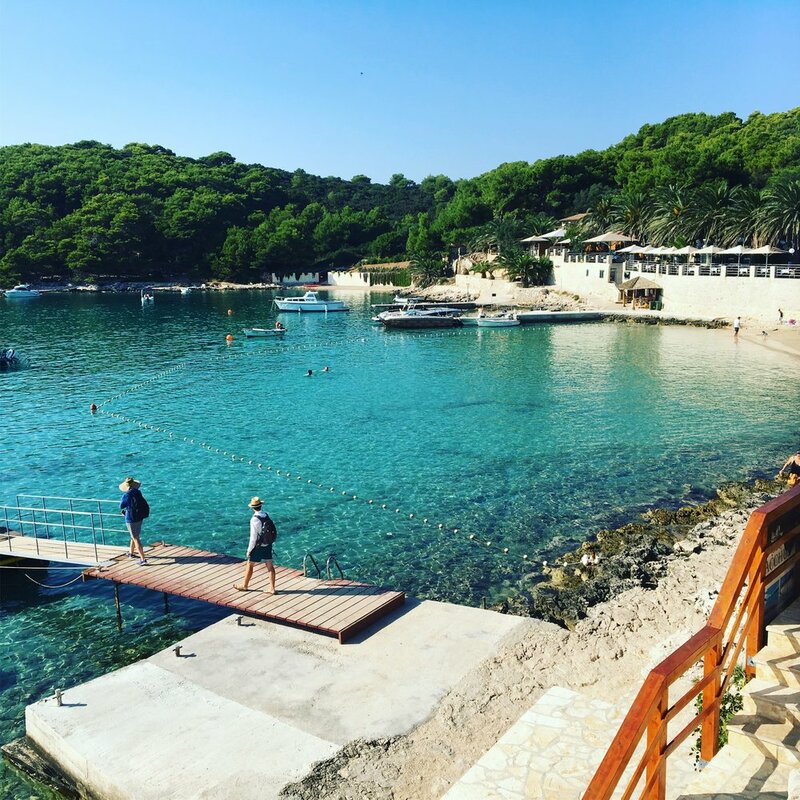 Our plan was to visit Split and Hvar but we got more than we bargained for. When we first arrived at night as we rolled our luggage through the cobblestone floor in the Diocletian Palace, we were excited to see people having dinner in alcoves and having drinks on tables along the narrow walkways. These narrow walkways were bustling with romance and we couldn’t wait to drop off our luggage. This town is considered to have a lot of tourists for their piazzas built in 300 AD in the Diocletian Palace. 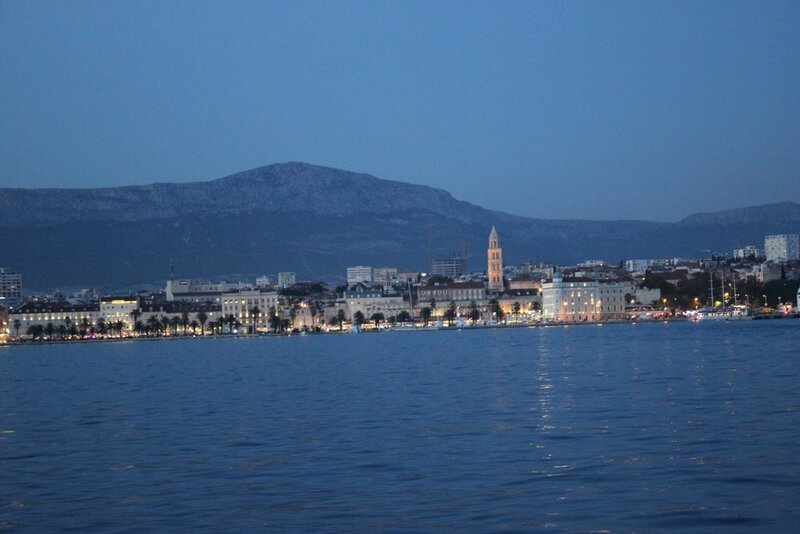 I recommend staying within the walls of the palace and explore the area around the town of Split. Stay for at least 3 nights to visit the Krka National Park and the next day to do wine tasting. I’d recommend taking a day trip to the waterfalls of Krka National Park about an hour away. This was the plan, but we were so mesmerized by the town, we decided to walk up the hill to get a clear look at the vista and then a sunset boat ride along the coast. Still wasn’t a bad idea. We are really glad we kept exploring around this town. As we looked for a wine tasting room that was recommended we actually ran into another maze of narrow walk ways that housed what looked like all the restaurants in town aside from the waterfront restaurants. This island is the point to visit all the rest of the islands while staying in upscale hotels and enjoying cafes and beautiful restaurants. The water was a little cold in October but worth it! The island of Palmizana is an island for those who like discretion. It’s a hidden gem that we actually got lost when we got off the boat. From the looks of it, there didn’t seem to be any habitation but to our surprise, there were little markets to pick up snacks, a steakhouse and signs that led into a forest of more upscale restaurants to choose from. As we walked down a path that was taking us to the other side of the island, we saw many different trails to different restaurants. We decided to walk straight and stumbled on a beautiful cove on the other side of the island (shown above) where we were dropped off. I couldn’t believe on what looked like a desolate island were actually restaurants lined along the waterfront with places to sun bathe. I said, well, we have about 5 hours here to enjoy so why not. We changed out of our wine tasting clothes into our bathing suits. As we arrived back to the airport in Split, the airline host said we were 5 hours too early because I misread our itinerary. She said not to worry because the town of Trogir was about a 10 min bus ride that we could explore and have lunch before our flight left. 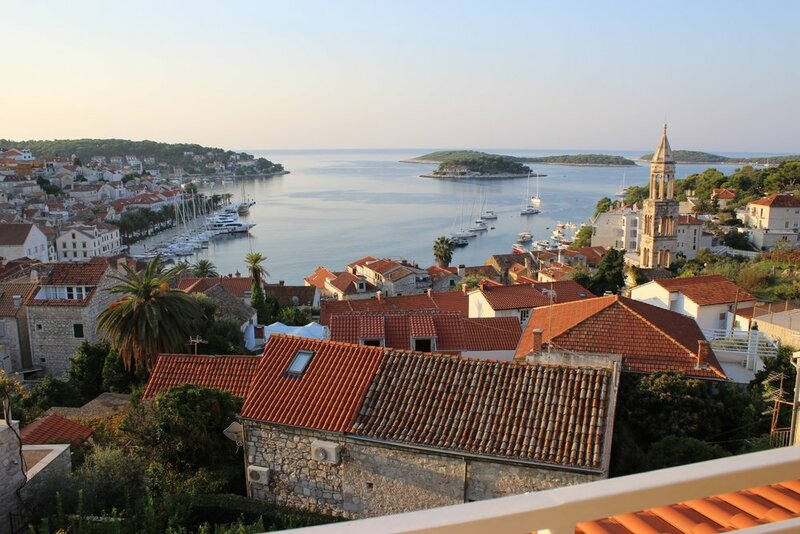 It turns out, Trogir is another great town to see. I would recommend dropping your bags off at the airport, get on a bus and explore. Although there were cafes and restaurants along the water, we decided to discover an off-the-beaten path place to eat. 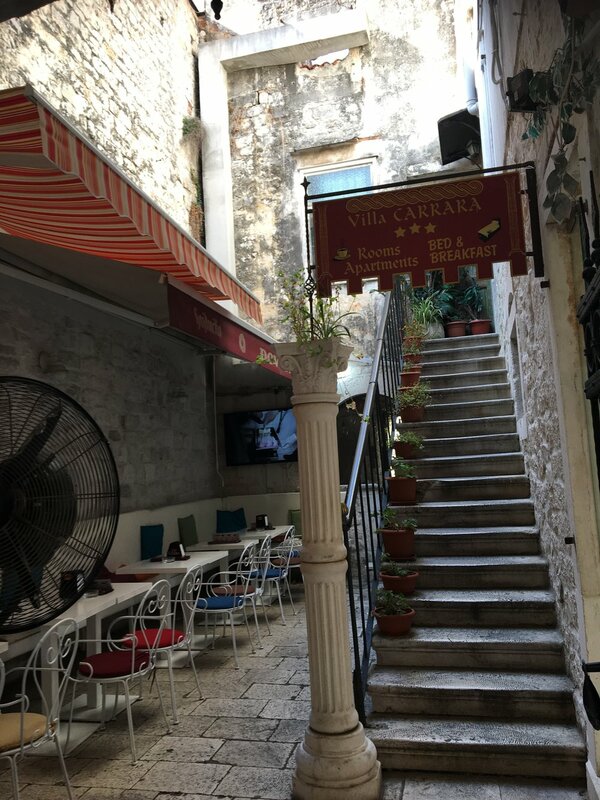 As we continued to walk into the narrow walkways again, only reachable by foot, we found restaurants snugged together into small piazzas unlike the town of Split (similar to the one on the left). We eventually found a cozy Italian restaurant that served seafood dishes with their pizza. Seafood dishes with Italian food is common and like this pizzeria, it is family owned. Whatever your destination you plan to stay in Croatia, you’ll most likely stumble on hidden gems. The point is to just go with it and know that you’re discovering a country full of surprises. What is on your bucket list to see in Croatia?